The featured report, “Anti-reflective Coatings Market - Global Industry Analysis, Size, Share, Growth, Trends and Forecast, 2014 - 2020”, from Transparency Market Research (TMR) offers the latest insights into the global anti-reflective coatings market. According to this report, the global anti-reflective coatings market will expand at an 8.2% CAGR during the forecast period from 2014 to 2020. In 2013, the global anti-reflective coatings market was estimated at US$2.9 bn and by 2020, it is expected to be worth more than US$4.9 bn. 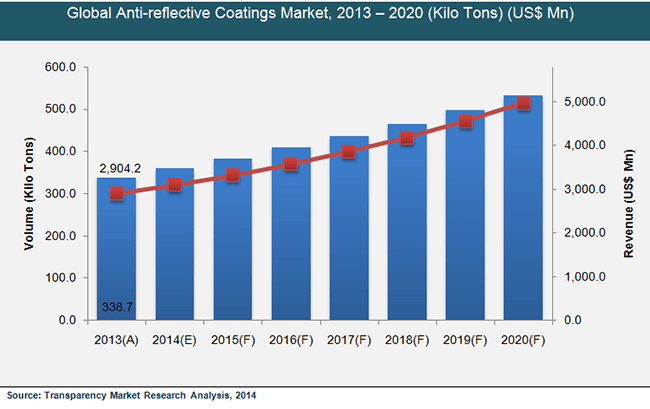 The global anti-reflective coatings market will almost double in value in the next few years. Factors such as the growing demand for high light transmitting eyeglasses and lenses and growing consumption of these coatings in the electronics sector are driving the global anti-reflective coatings market. Furthermore, the expanding eyewear, flat display, and semiconductors markets are also boosting the overall anti-reflective coatings market. Players in the global anti-reflective coatings market will also benefit from the rising demand from the solar energy industry. Nevertheless, the global anti-reflective coatings market will be restrained by the lack of awareness among consumers, usability issues, and the stringent environment regulations related with raw materials.On the basis of end use, the global anti-reflective coatings market is segmented into automobiles, solar power, electronics, eyewear, and others such as telecommunication. Anti-reflective coatings are gaining popularity in these end-use industries due to their ability to enhance visibility, as they block unwanted reflections from various types of surfaces. Anti-reflective coatings are primarily used in the optical and electrical sectors to reduce glare and minimize reflection. The eyewear sector dominated the global anti-reflective coatings market in 2013, when the sector held a share of approximately 40% in the global anti-reflective coatings market. Anti-reflective coatings are applied on a wide range of substrates such as sapphire, yttrium aluminum garnet, and quartz. Other prominent applications of anti-reflective coatings are kiosk displays, telescopes, riflescopes, video glasses, and binocular lenses. According to the report, the electronics segment will show robust growth during the forecast period due to the high demand for anti-reflective coatings from flat panels and smartphones. Region-wise, the global anti-reflective coatings market is divided into Asia Pacific, Europe, North America, and Rest of the World (the Middle East, Africa, and Latin America). The Europe anti-reflective coatings market will benefit from rising demand from the solar power and automobiles end-use sectors. In addition to this, the stable demand from the eyewear industry will also fuel the Europe anti-reflective coatings market. On the other hand, North America will witness high demand for anti-reflective coatings from the smartphone displays, lenses, and eyeglasses sectors. On the other hand, the Asia Pacific anti-reflective coatings market will benefit from the elevated demand in emerging nations such as India, China, and South Korea. The key players operating in the global anti-reflective coatings market are Rodenstock, PPG, Optical Coatings, Koninklijke, JDS Uniphase, Janos Technology, iCoat Company, Hoya, Honeywell, Essilor, and Carl Zeiss. The rising demand from consumers for the latest innovative products is in turn driving R&D in the global anti-reflective coatings market. In March 2015, a new anti-reflective coating was developed inspired by moth eyes. This technology is expected to boost the efficiency of solar cells and sharpen the view of image sensors.